Two gilded edges establish this 14K white gold heart wedding ring as a gleaming work of art from Apples of Gold. 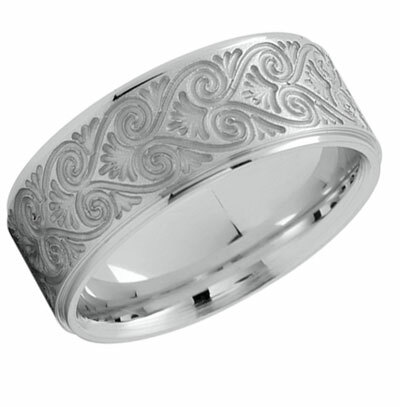 Delicate filigree is placed intricately throughout the 8mm band, creating a lovely design. The white gold of this ring gleams brilliantly, and hearts are crafted throughout the band, composed of lines that swirl together. The graceful artwork encompasses the width of the band, making this ring a true treasure from Apples of Gold. We guarantee our Artisan Heart Wedding Ring in 14K White Gold to be high quality, authentic jewelry, as described above.